In a survey of 1,500 finance professionals, nearly 50% reported relying on gut instinct rather than hard data to make important business decisions. The 2015 survey—commissioned by Epicor and conducted by Redshift Research Ltd.—also revealed that a majority of CFOs and financial decision-makers are still relying on spreadsheets to interpret business data. Without adequate data, it’s onerous for leaders to gain the insight they need into the company’s strengths, challenges, and opportunities. 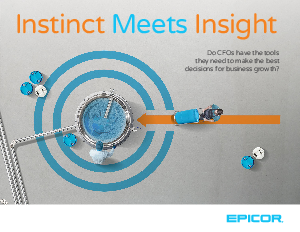 In our “Instinct Meets Insight” eBook, you can review the results of the survey in closer detail and explore how a modern financial IT infrastructure—which delivers the right data to the right people and at the right time—can help CFOs and financial decision-makers back up instinct with relevant data they can rely on to help their businesses grow. Get the eBook to find out how you compare to your peers and learn how you can combine instinct and insight with the right business software solution.